Digital transformation is creating challenges in quality assurance and testing operations for many CIOs as they find a tension between methods used for legacy technology and methods used for more modern technology, according to the eighth annual World Quality Report from Capgemini. As enterprises adopt new technologies like the Internet of Things (IoT) and other digital tools that change the way their business run and interact with customers, the field of QA looks to be more challenged than it was in any previous report. The research conducted a survey with 1,600 CIOs and IT testing leaders from 32 countries around the world, including 300 from North America. While it’s still important that testing meets its core objective of preventing defects, it must also be directly related to creating customer value, the research shows. One of the main factors contributing to the increased challenge is the difference between traditional core enterprise IT (systems of record) and newer digital line-of-business IT (systems of interaction), according to Capgemini. QA requires a different set of processes in these different areas and often a different set of skills as well. For example, this graphic shows that more survey respondents spoke up across all seven top challenges of application development in 2016 compared to 2015. Overall, organizations are struggling to strike the right balance of meeting speed with the right level of quality. With more enterprises following an agile methodology, figuring out how to incorporate QA into that approach can be challenging. More than four in 10 respondents using agile say that involving the testing team in the inception and spring planning phases is a challenge. As businesses undergoing digital transformation projects restructure to make customer focus more of a priority, the quality of any digital experience offered to those customers have with the brand matters. But that can be at odds with trying to run an agile business that is pushing out innovative new products ahead of the competition. It’s a problem that Fortune 500 companies are facing regularly and with very real impacts, according to Theresa Lanowitz, independent IT consultant and founder of Voke Inc. The key to moving quickly and ensuring quality at the same time is to give developers tools to test on all platforms. Tests should also be done using data that’s as close to the real-world scenario as possible. To enable this sort of testing, developers should be turning to container technology to virtualize test environments and run simulations. 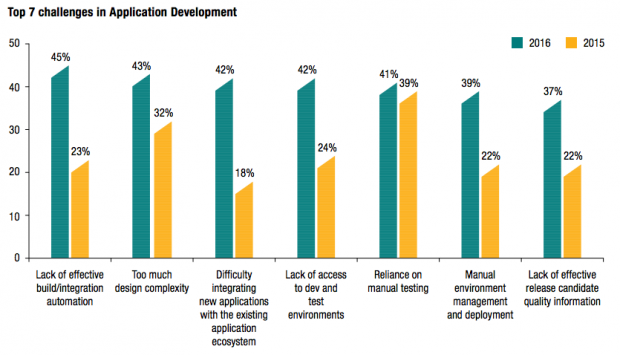 Yet according to the Capgemini survey, there is less automation used in testing than there was in 2015. So while the current talent base of QA testsers are well versed in the automation techniques needed to keep up with core IT assets, there’s a lack of talent that’s adept at implementing the automation for modern digital applications. The good news is that young graduates can be trained in the new approach to QA testing in just four weeks, he says. But trying to train a worker used to legacy QA testing could take as long as 12 weeks because they are attached to another methodology that won’t work.